شیخ محمدی, سمیه, اصغری, امید, نوروزی, غلامحسین. (1393). استفاده از متغیر کمکی ضریب سولفیدی به‌منظور بهبود نتایج برآورد مس با کوکریجینگ هم‌مختصات و کریجینگ با روند بیرونی. مجله ژئوفیزیک ایران, 8(1), 45-58. سمیه شیخ محمدی; امید اصغری; غلامحسین نوروزی. "استفاده از متغیر کمکی ضریب سولفیدی به‌منظور بهبود نتایج برآورد مس با کوکریجینگ هم‌مختصات و کریجینگ با روند بیرونی". 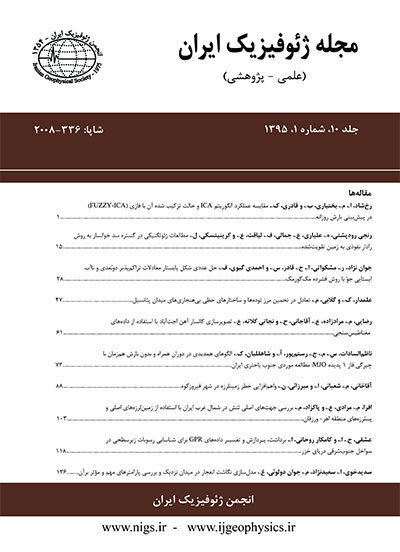 مجله ژئوفیزیک ایران, 8, 1, 1393, 45-58. شیخ محمدی, سمیه, اصغری, امید, نوروزی, غلامحسین. (1393). 'استفاده از متغیر کمکی ضریب سولفیدی به‌منظور بهبود نتایج برآورد مس با کوکریجینگ هم‌مختصات و کریجینگ با روند بیرونی', مجله ژئوفیزیک ایران, 8(1), pp. 45-58. شیخ محمدی, سمیه, اصغری, امید, نوروزی, غلامحسین. استفاده از متغیر کمکی ضریب سولفیدی به‌منظور بهبود نتایج برآورد مس با کوکریجینگ هم‌مختصات و کریجینگ با روند بیرونی. مجله ژئوفیزیک ایران, 1393; 8(1): 45-58. طرح‌­های معدنی اغلب با عدم قطعیت و مخاطره همراه هستند و هدف مدل‌سازی، برآورد ذخیره، کاهش واریانس برآورد و عدم قطعیت به‌‌منظور کاهش مخاطره تصمیم‌گیری است. از سوی دیگر یکی از راه‌های کاهش واریانس برآورد، اجرای حفاری­های گسترده و پُر­هزینه در منطقه است. از دیگر روش­های کاهش واریانس برآورد که با صرف هزینه کمتر قابل اجرا است، روش­های زمین­آماری چندمتغیره است. در این تحقیق از روش­های کوکریجینگ هم‌مختصات و کریجینگ با روند بیرونی که می‌‌توانند با استفاده از متغیر کمکی (در اینجا ضریب سولفیدی) به بهبود نتایج کمک کنند، به‌‌منظور برآورد متغیر عیار مس معرفی می­شوند. منطقه مورد بررسی در یکی از مناطق پتانسیل­دار مس، واقع در استان کرمان است. برای برآورد چگونگی توزیع عیار مس در منطقه، از داده­های ضریب سولفیدی استفاده شد، زیرا نسبت به حفاری­های صورت‌پذیرفته پوشش بیشتری در منطقه دارد و با هزینه کمتری نیز همراه است. در اجرای روش کوکریجینگ هم‌مختصات فقط داده‌های ثانویه هم‌مختصات با محل برآورد متغیر اولیه در نظر گرفته می‌شوند. نتایج این بررسی نشان داد که استفاده از این دو روش، نسبت به روش کریجینگ معمولی که از متغیر ثانویه استفاده نمی­کند، کیفیت نتایج توزیع مس را بهبود می‌دهد. اعتبارسنجی نتایج با استفاده از روش اعتبارسنجی حذفی صورت گرفت. براساس معیارهای میانگین قدر مطلق خطا (MAE)، ریشه دوم میانگین مربع خطا (RMSE) و ضریب همبستگی مقادیر مشاهده­ای و واقعی (R)، روش­های کریجینگ با روند بیرونی و کوکریجینگ هم‌مختصات، نتایج بهتری را آشکار ساختند. In projects of reserves estimation, we would like to reduce the estimation variance and related uncertainty. This reduction usually requires extensive and costly drilling. Multivariate geostatistical methods could be noted as an inexpensive and budget saving method to reduce the estimation variance. Often, there exists much secondary data that must be considered in a geostatistical reservoir modeling. All secondary data being used as a secondary variable must be highly correlated with the primary one. This work introduces the collocated cokriging and kriging with an external drift to incorporate sulphide factor as secondary information to estimate the copper content in a porphyry system. The study area was one of the desirable areas of copper, located in Kerman Province. Sulphide factor as highly correlated and fully covered data was selected to improve the estimation of copper in this region. In collocated cokriging, the number of the secondary information used for estimation is reduced to the estimation location. However, the datum colocated with primary data implementations of collocated cokriging is often limited to a single secondary variable. Improved models would be constructed if multiple variables were accounted for simultaneously. Contrary to cokriging, kriging with an external drift does not make explicit the structural link between the target variable and the auxiliary variable, for the latter is considered to be deterministic. After determining the mean of the estimation variance, experimental results showed that both methodologies incorporating secondary information led to better results than ordinary kriging that did not incorporate any sulphide factor data. The ordinary kriging method uses only cupper assay information‚ while in collocated cokriging and kriging with an external drift, both cupper assay and sulphide factor information are used as an auxiliary variable. The validation sample was used to compare the performance of the methods. Collocated cokriging and kriging methods with an external drift based on mean absolute error (MAE), root mean square error (RMSE) and the correlation coefficient of real and estimated values (R) illustrate better results. فرج‌پور، ز.، نبی بیدهندی، م.، ترابی، م. ر.، و باقری، م.، 1389، مقایسه روش­های زمین­آماری جهت تعیین توزیع تخلخل در یکی از میادین نفتی جنوب غربی ایران: چهاردهمین کنفرانس ژئوفیزیک ایران، مقالات پوستری، ۹۴۸– ۹۵۱. انصاری، م. ح.، 1386، مطالعه ژئوفیزیکی در محدوده سریدون کرمان: پایان­نامه کارشناسی ارشد اکتشاف معدن، دانشگاه تهران. Barzegar, H., 2007, Geology, Petrology and Geochemi­cal Characteristics of Alteration Zones within the Seridune Prospect, Kerman, Iran: unpublished Ph.D. thesis. Boezio, M. N. M., Costa, J. F. C. L., and Koppe, J. C., 2006a, Accounting for Extensive Secondary Informationto Improve Watertable Mapping: International Association for Mathematical Geology. Boezio, M. N. M., Costa, J. F. C. L., and Koppe, J. C., 2006b, Kriging with an external drift versus collocated cokriging for water table mapping: Applied Earth Science (Trans. Inst. Min. Metall. B). Bourennane, H., King, D., and Couturier, A., 2000, Comparison of kriging with external drift and simple linear regression for predicting soil horizon thickness with different sample densities: Geoderma, 97, 255– 271. Borennane, H., and King, D., 2003, Using multiple external drifts to estimate a soil variable: Geoderma, 114, 1–18. Boxter, S. J., and Oliver, M. A., 2005, The spatial prediction of soil mineral N and potentially available N using elevation: Geoderma, 128, 325–339. Fernandes, J. A. B., and Rocha, M. M., 2010, Kriging with External Drift Applied to Evaluation of Mineral Resources of Limestone and Lateritic Ore: IAMG. Goovaerts, P., 1999, Using elevation to aid the geostatistical mapping of rainfall erosivity: Department of Civil and Environmental Engineering, The University of Michigan, Ann Arbor, MI 48109-2125, USA. Haberlandt, U., 2007, Geostatistical interpolation of hourly precipitation from rain gauges and radar for a large-scale extreme rainfall event: Institute of Water Resources Management, Journal of Hydrology, 332, 144– 157. John, D. A., Ayuso, R. A., Barton, M. D., Blakely, R. J., Bodnar, R. J., Dilles, J. H., Gray, Floyd, Graybeal, F. T., Mars, J. C., McPhee, D. K., Seal, R. R., Taylor, R. D., and Vikre, P.G., 2010, Porphyry copper deposit model, chap. B of Mineral deposit models for resource assessment: U.S. Geological Survey Scientific Investigations Report, 2010–5070–B, 169 p.
Kay, M., and Dimitrakopoulos, R., 2000, Integrated Interpolation Methods for Geophysical Data: International Association for Mathematical Geology. Qi, J., Mu, C., and Zhang, T., 2010, A Novel Porosity Simulation Method using the Markov Model: Computer Science and Information Technology (ICCSIT), 2010 3rd IEEE International Conference on, 2, 549 – 553. Troisi, S., Fallico, C., Straface, S., and Migliari, E., 2000, Application of kriging with external drift to estimate hydraulic conductivity from electrical-resistivity data in unconsolidated deposits near Montalto Uffugo, Italy: Hydrogeology Journal, 8, 356–367. Wackernagel, H., 2002, Multivariate Geostatistics: Springer, 165-170.